This recipe is summer 2011’s most pleasant discovery. 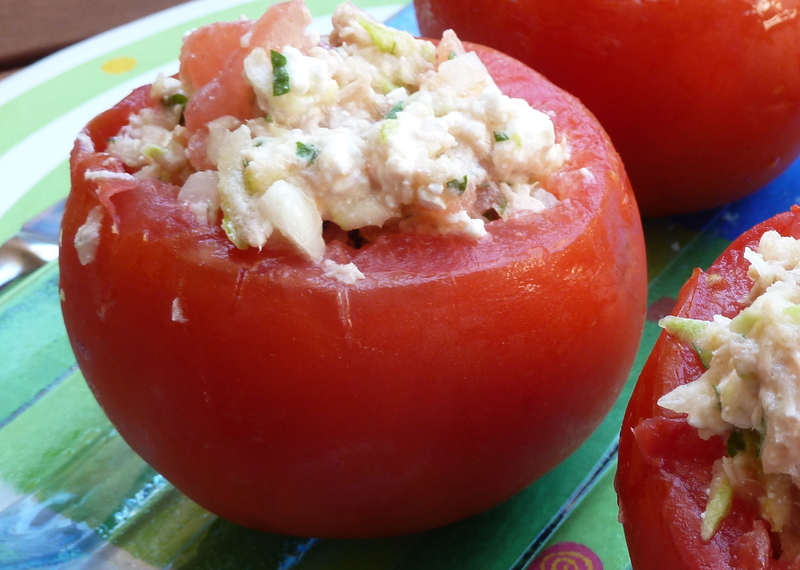 Fresh tomatoes stuffed with tuna fish, grated zucchini and plenty of herbs. Amazingly refreshing and light for summer. We fell in love. I got it from the printed version of Gastronomos that comes with a Sunday paper and it is signed by Dina Nikolaou. I hope I’ll be lucky to get another issue of Gastronomos and Gourmet before we leave for the States. How to make: First get the tomatoes ready. Remove the “caps” so the top part is open. Remove the inside part of the tomatoes and save it in a bowl. Sprinkle some salt and pepper, also a bit of sugar, in each tomato. Put them upside down on a rack and let them drain for at least 15 minutes. Now, onto the filling. Cut any bigger chunks from the inside of tomatoes into small cubes. Drain the tomato bits and keep the liquid in another container mixed with 20ml olive oil. You can use this sauce later for serving. In the bowl with the tomato chunks add the tuna fish (strained), “katiki” or crumbled feta, parsley, onions, zucchini and the rest of the olive oil. Give them a good stir. Cover with cling film and store in the fridge for at least 10 minutes. When ready to serve, drain any excessive liquids, fill the tomatoes, arrange them in a serving platter, pour some of the tomato-olive oil sauce and serve. Notes and tips: In case you haven’t grated zucchini before: wash the zucchini, remove the edges and grate them just like you’d grate cheese. If you only have tuna in water, drain the cans and add some vegetable oil in the cans while you’re getting everything else ready. When ready to use, drain any excessive oil. The dish looks better with expensive, chunkier tuna. I got cheaper cans with tuna that was more ‘mushy’.